As you have probably heard, Trump gave a press conference yesterday. Which is actually a very normal thing for presidents to do. Except Trump doesn’t engage in normal behavior. His conflict with a CNN reporter where he refused to take a question because he claimed that CNN is “fake news” got most of the headlines. Especially since he went straight from that to taking a question from a Breibart reporter. Just in case anyone was under the impression that Trump was actually concerned about fake news. But this press conference had several other unusual features which I want to call attention to lest we miss the depth of what is going on while distracted by the spectacle. First, Trump had staffers fill the back of the press room, forcing actual reporters to listen from the hallway. During the press conference, these paid staffers cheered and jeered on cue, much like the audience at one of his rallies would. Some of this may have been for the benefit of Trump who obviously enjoys having people who clap, cheer and holler at the sound of his voice. Some of this is part of his ongoing intimidation campaign against the press. Can you imagine trying to do your job while someone stood there jeering at you? And some of it is because many of his supporters are gullible and live in a bubble where Trump is victorious, admired and in the process of changing the world, so hearing the sound of cheers and jeers coming from a room of reporters will affirm their perception that Trump is winning everyone over. Second, during the press conference, Donald Trump had a table piled with papers in folders next to the podium. 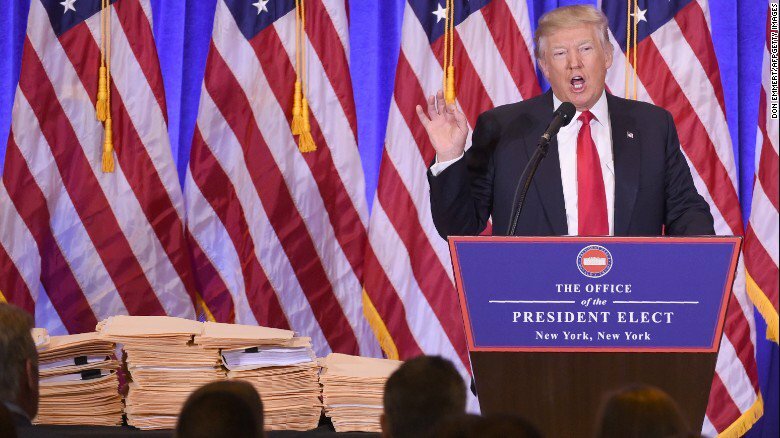 He claimed that these folders contained the paperwork for every one of his companies to be put into blind trusts, thus addressing questions of conflicts of interest. Problem is that the folders and papers appeared to be blank. There were no page numbers, headers, notes or tabs of the sort which can be seen on the edges of real legal paperwork visible. And the papers were the wrong size for legal work; they were regular 8×11 papers rather than the standard legal paper used for such things. They didn’t even bother putting labels on the folders holding the “paperwork”. So it appears that the table was filled with blank sheets of paper shoved into folders and piled on a table rather than with actual paperwork. Which is rather apropos seeing as according to legal experts, the measures he announced don’t actually qualify as blind trusts, nor do they do much to address conflicts of interest. So gaslighting and deception all around. Yes, yes, yes…keep up the good writing. Please keep up the good work of deconstructing what Trump, the sociopath, is doing to the American people!